Only the second feature from writer/director Barry Jenkins (Medicine for Melancholy), Moonlight is an electrifying mix of cinematic art and plot-based storytelling that should satisfy viewers looking to be both moved and entertained. Profound and gripping, in equal measure, it offers an finely crafted tale of a young African-American man’s coming-of-age, filled with rich performances and gorgeous cinematography (courtesy of James Laxton, Camp X-Ray). Each scene unfolds with such precision and assurance that it is hard to imagine that any other directorial choice, anywhere, would have worked as well. Brutal though the tale may be, it is beautiful to behold. A triptych with each chapter delineated by a title card showing a different name for the main character, Moonlight starts when Chiron, then called “Little,” is but a child. Smaller than his peers, and a frequent target of their attacks, he has only one friend, Kevin, with whom he bonds through friendly wrestling matches. Chiron lives at home with his single, drug-addicted mother (Naomie Harris, Mandela: Long Walk to Freedom), who provides none of the peace and security that he needs. So when a local drug dealer, Juan (Mahershala Ali, House of Cards) finds him hiding from a gang of bullies and takes him home (where he lives with his girlfriend), Chiron can’t help but respond, even if warily, at first, to the warmth shown to him. Years later, in the third part, he will adopt the look and mannerisms of this surrogate father. The second part – “Chiron” – takes place in the hell of high school, where the physical delicacy that marked the child now dooms him, as a teen, to constant harassment. His peers assume he’s gay, which he may be, but his real crime, in their eyes, is the sensitive way he gazes at the world. His mother is worse off than before, and therefore still no help, but Kevin remains, the one friend with whom Chiron can be himself without fear of attack. Until, that is, a schoolyard incident brings everything to a violent head. We then cut to the final story – “Black” (Kevin’s nickname for Chiron) – in which all the disparate threads of the narrative are finally woven together. Chiron is now a muscled hunk, dealing drugs, disciplined but adrift. Can he ever become a complete human being, reconciling his repressed homosexuality with the tough new identity he has forged? The magic of the movie is in the way Jenkins resolves Chiron’s dilemma without forcing a false catharsis. There’s no big overwrought conclusion; just heartfelt and well-earned tears. Everyone shines here. Not only Ali and Harris (in a thankless part), but the three actors – newcomer Alex Hibbert, relative newcomers Ashton Sanders (The Retrieval) and Trevante Rhodes (The Night Is Young) – who play Chiron in each segment. More importantly, each actor works beautifully with the rest of the cast; it’s a wonderful ensemble piece. 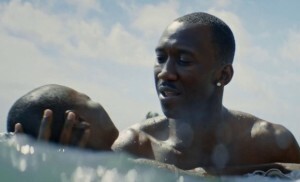 Moonlight is a powerful film, exquisitely made, that tells a story of how love can heal all wounds, especially if that love comes from an unexpected place. It’s also one of the best films of the year.